Blessed Francis Palau y Quer, like so many other Carmelites, writes beautifully of the union of the soul with God in mystical marriage. He was born in Spain in 1811, the seventh of nine children of Jose Palau and Maria Antonia Quer. He entered the Order in 1832 and was ordained a priest in 1836 during a period of civil unrest that resulted in the closing of his monastery. Blessed Francis lived in exile and in solitude in France, coming back to Spain in 1851 to found what he called "The School of Virtue" for catechetical instruction. The school was suppressed in 1854, forcing Francis into solitude again until 1860 on the rocky coast of Ibiza where he shared mystically in the sufferings of the Church. It was here that his writings, "The Struggle of the Soul with God," were born. In 1861, Francis founded the Congregation of Carmelite Brothers and Sisters. 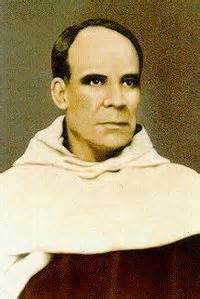 He died at Tarragona in 1872 and was beatified by Pope John Paul II on April 24th, 1980.